That Comes With A Guarantee! In 2 to 4 Days! 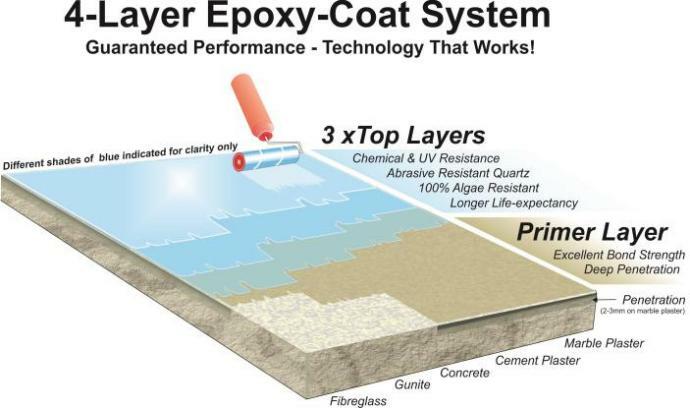 A tough and durable 4-LAYER Epoxy Coat system manufactured by Pool Solutions. 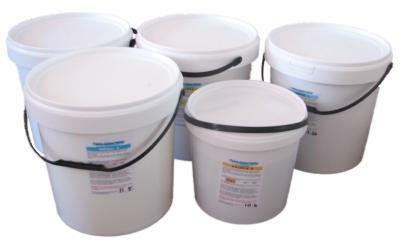 Available as DIY pool paint kits or full application in areas where we have registered contractors. Order now and we will deliver your DIY kit at NO EXTRA CHARGE! 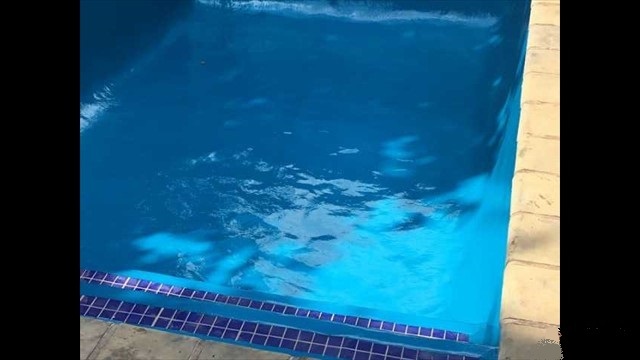 If you are tired of scrubbing that rough, stained surface that is probably scratching the skin of of your children's toes, and own a swimming pool that has lately been looking attractive only to the nearby frog colony, we have the Epoxy Pool Paint solution for you. Our latest technology and breaktroughs in epoxy formulations targeted for submerged conditions have worked successfully for more than 20 000 swimming pool owners since 1998. It is time to get rid of that porous and rough marble plaster or Gunnite finish that is so easily stained and pitted. And that old, dull fibreglass lining? A thing of the past! 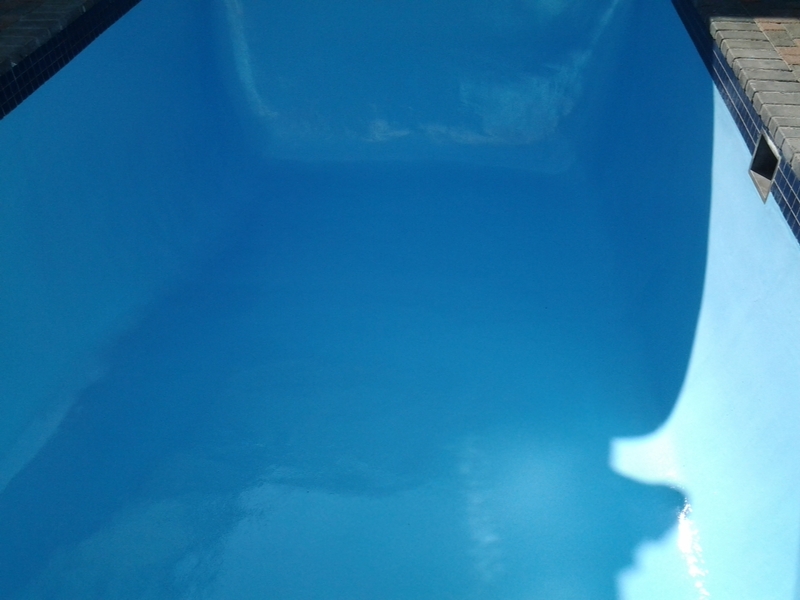 We have been manufacturing a durable Epoxy Pool Paint system will have your pool looking brand new again in no time. 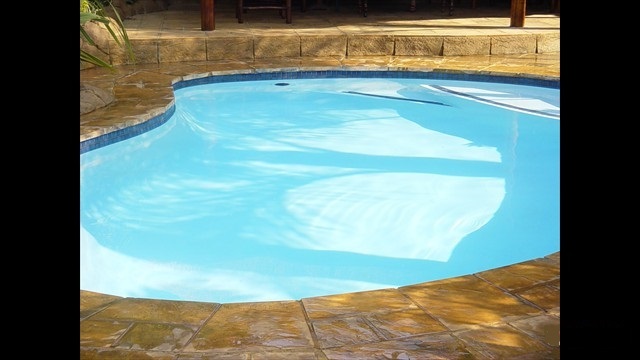 We do not compromise on quality - ProShield high-gloss, chemical-resistant Epoxy Swimming Pool Paint is unique and unmatched in the swimming pool market. We have developed from the start to offer top performance under these challenging, submerged and chemical rich conditions (not derived from indoor floor epoxy formulations). We ensured the product offers the highest bond-strength, UV and chalk resistance. It also offers 100% resistance against algae infestation. This is the easiest and most cost-effective solution for resurfacing and repairing your swimming pool with long-lasting results. 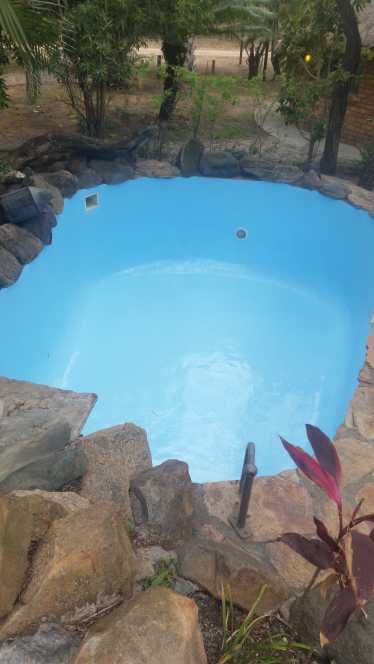 It is available in DIY Pool Paint packages; or we can refer you to one of our experienced contractors to do the pool repair and resurfacing for you. Save thousands. 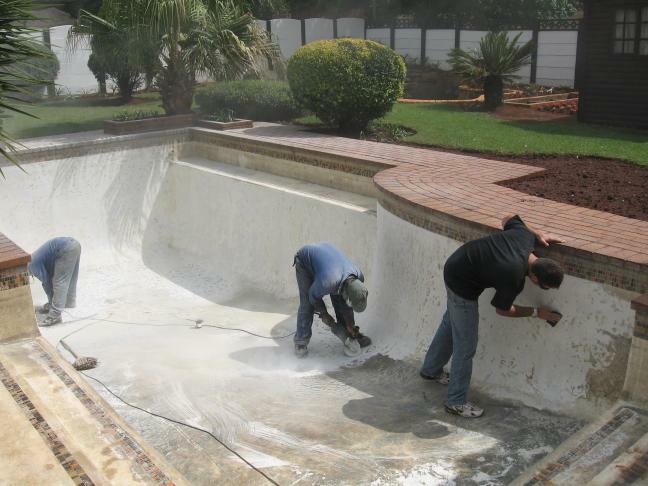 Why re-apply marble plaster or fiberglass just because your swimming pool is stained? 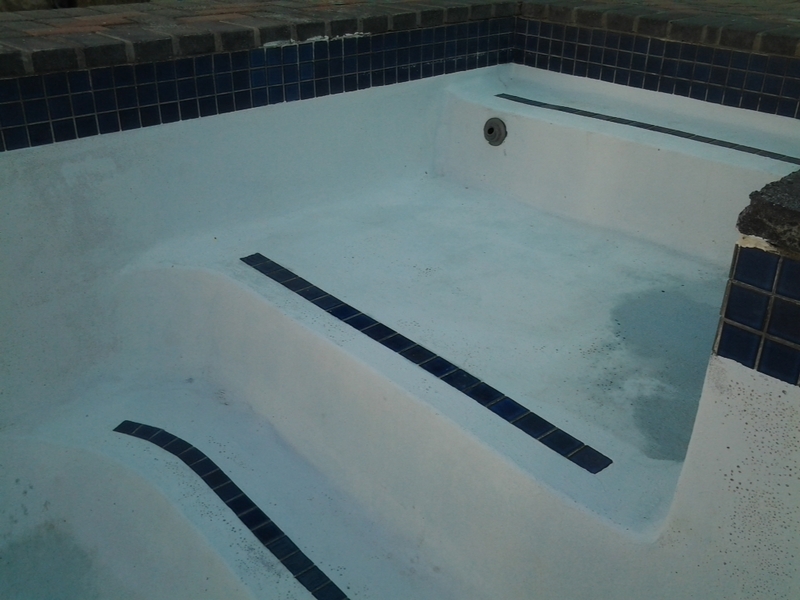 You can get excellent results with a durable, decorative Epoxy Pool Paint at a much lower cost. Pool renovation is now easier than ever before; even touch-up repairs at any stage require less effort than other lining options – at a fraction of the cost! Choosing our DIY Pool Paint solution can save you even more. Please note that a solid, non-brittle and strong surface is still required to sustain the epoxy pool paint layer. Rain resistant within 3 hours after application (25 ˚C). With a little bit of research you can save yourself from a potential disaster, especially during the rainy season. Ensure you enquire about this specification when buying any product (read the datasheet if available). Traditional indoor floor epoxy solutions sold as swimming pool paint are simply not up to par. Rain will not damage our product after a few hours of drying, thereby avoiding pigment wash or discolouring (8 hours of drying may be required during the winter for the coating to become rain resistant). Our product was developed for 24/7x365 submerged conditions and quick waterspot resistance. No more scrubbing and shock treatingthe pool. You can now enjoy 100% resistance against algae stains. 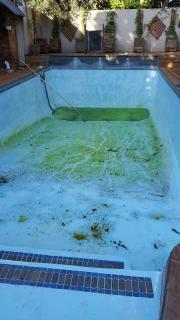 Algae will not cling to this enamel gloss pool paint. Algae growth is therefore drastically reduced, and the water can be kept clear and blue with less effort. Pool Maintenance Is Now Easier Than Ever. 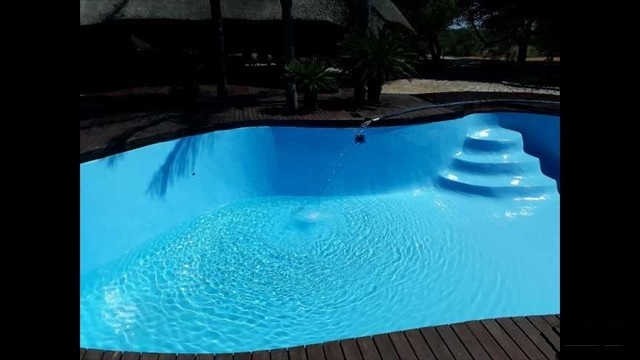 Normal HTH Swimming pool chemicals, pool acids, and recommended products can be added directly into the pool without the fear of staining the epoxy paint layer. See our FAQ page for recommendations on chemicals that will prolong the life-span of the product. A Beautiful Sparkling Pool for many fun-filled summers. The expected lifetime of our pool paint epoxy is 8-10 years under well-maintained water conditions. Under more severe conditions and with salt-chlorinators, its lifespan can be reasonably expected to be around 5-6 years. However, touching up is cost-effective; when the paint layer starts to wear thin, re-applying two new top-coat layers is all that is required. 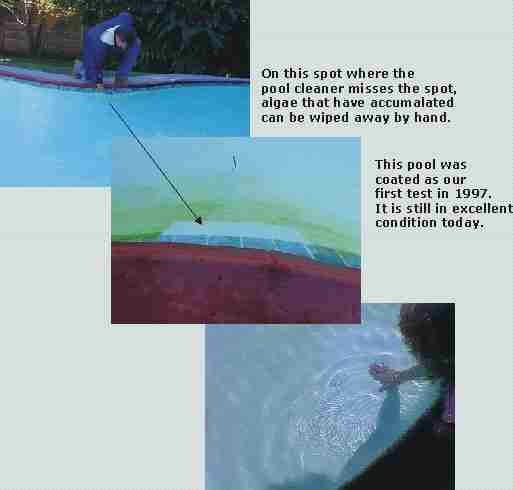 As a testament to the quality of our product, our first test-pool was coated in 1997, and was still covered in its original coating when we re-visited it in 2008. (More details about our history further below.) Also see other testimonials of our satisfied clients on the right side of this page; some of whom reported up to 15 years of product performance. Save 50%-70% On Chemicals. 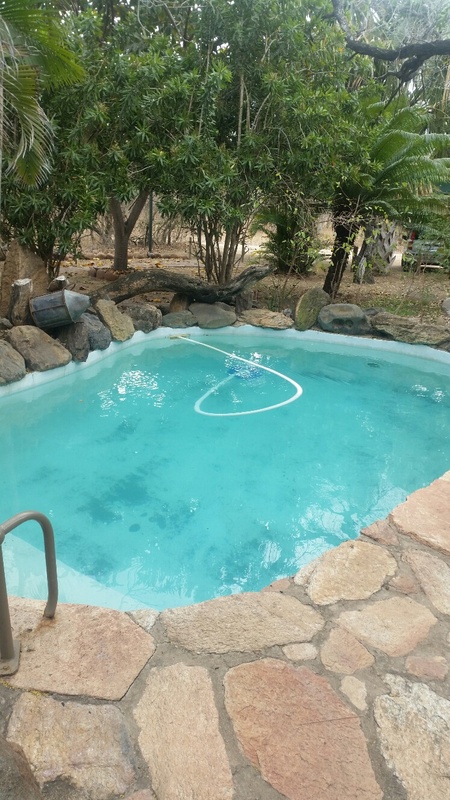 Maintenance is a breeze with an epoxy-coated swimming pool; in fact, you can keep your pool sparkly clean and blue with a simple HTH month pack floater and not worry about it any further. Many clients have reported a 50% saving on chemicals and pool maintenance costs. Our product can be used in conjunction with salt chlorinators set to the correct required dosage. See our FAQ page for more details. No More Bleeding Toes. Have you ever had to nurse your children’s bleeding toes after hours of playing in a marble-plastered swimming pool? 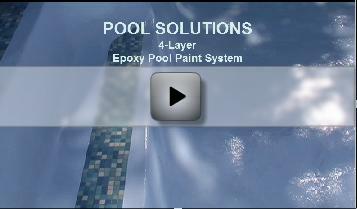 They can now relax and play all day with this smooth, glossy epoxy pool paint system. Have you ever slipped on a wet fiberglass pool? 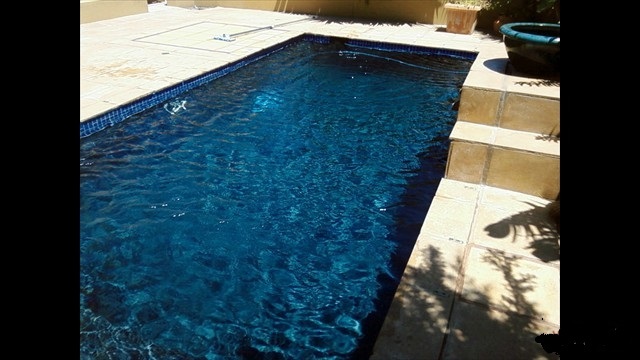 Our pool paint epoxy, although glossy and shiny*, offers better grip to the skin than fiberglass. *Please note that the product will be a bit slippery when newly applied due to the gloss finish, and care should be exercised when entering the pool. This slippery condition will improve within 6 months, offering a more rubbery grip to wet skin. 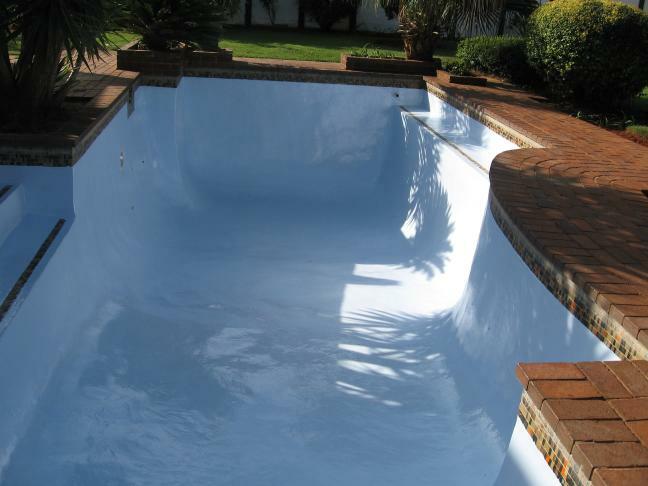 We offer our clients a 3-YEAR GUARANTEE on our pool paint against de-lamination. 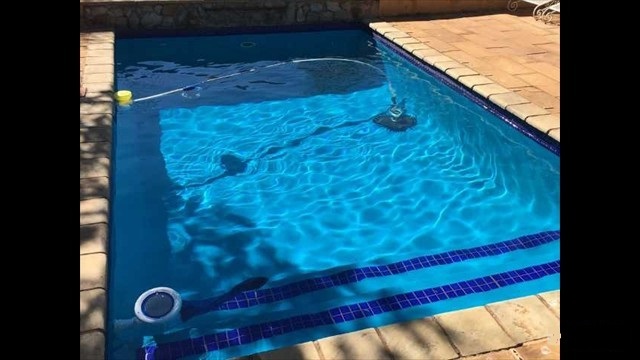 That's not all; should you need to do pool repairs for whatever reason within the three year gauarantee period even if outside our guarantee conditions, we will replace the product for you at our factory input cost level (no profit). We believe in friendly service and long-term customer support and once you are a customer, we hope you will stay our customer. Knowing how warranty offerings can trick clients into buying, especially by companies who are relatively new to the swimming pool paint industry, we do not use elaborate claims to lure customers but, instead, have kept our promises for twenty years and longer. We can offer references of clients that had our product installed for 10 - 15 years. See our testimonials on the right. If you see elaborate warranty offerings, please request references to verify the warranty period advertised. We have seen a number of newcomers in this market come and go or simply change their trading names within a few years. Tip: Confirm the creation date of an advertiser's website domain here: http://co.za/whois.shtml for .co.za domains. If they advertise a 10-year warranty but only registered their swimming pool paint website or trading name a year or two ago... well, you decide! Our guarantee is not an indication of expected life-span but, like all warranties, ensures peace of mind that you will have free support to overcome any product- or application-related problems for a considerable time after application, and that we will still be in business when you need us. Expected lifespan under controlled water conditions as per the recommendations can be 8 to 10 years as reported by many of our clients. After this time, should the top layer start to wear thin, re-application of two or three new colour top layers is easy and cost-effective. Even our DIY clients can enjoy this peace of mind! Yes, we will go this extra mile. After selling our product to thousands of successful DIY clients from 1998 onwards, we are confident that you can do the job following our online videos and comprehensive application installation instructions. When making use of one of our listed dealers/contractors, you can rest assured that they have contractually undertaken to adhere to this guarantee. No teething problems will ruin your investment. Our full guarantee and conditions can be viewed on the Guarantee page. DIY - Can I do it myself and save? The pitfalls - why buy our swimming pool paint? Give us the measurements of your pool, (+/- length, width avg. depth or circumference), we will quickly do the calculation and give you a price estimate. If you are interested in a full installation we will refer you to the nearest contractor who will follow up with a visit and a written quotation. Click here and use the login form on this page to gain access to our download page or to request information by email. 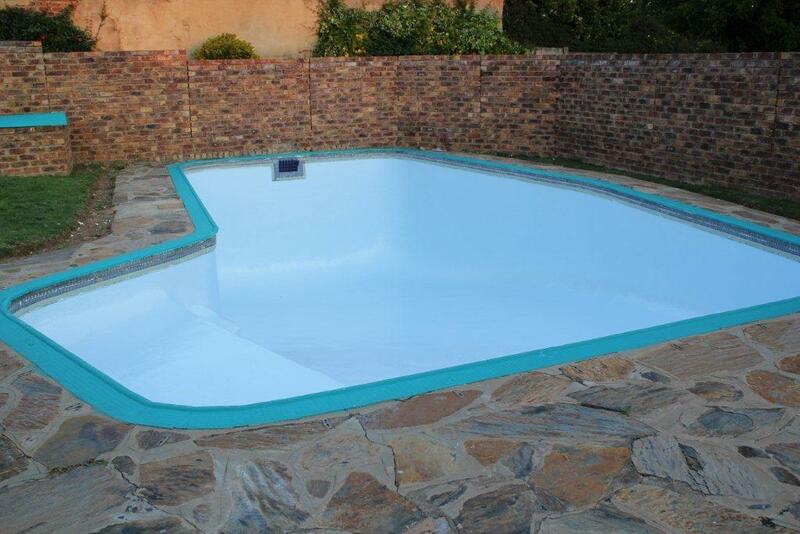 Our pool paint factory is situated in Pretoria. We will ship the package to your street address. Our DIY instructions are very comprehensive and will be included in the package, or you may download it from the Downloads-page. 1. Can you handle a grinder to slightly float-grind the pool surface and effectively paint with a roller and a paint brush? Yes? Then go ahead, we're sure you can do it. Of course, you must be willing to face the sun while sweating it out in a slippery swimming pool. Fill out the information request form and we will email you the application instructions right away. 2. Can you supervise one or two workers? Then why wait? You are the DIY manager type. Save heaps and hire two workers to do the paint work. Guide them step by step using our very detailed application instructions while sitting in the shade. Do your part in creating jobs, maybe you can even start a business doing all your friends' pools and earning the money back you've spent on your own pool. 3. Do you know a friend or a family member who is a handyman? Yes? You are the subcontracting type DIY enthusiast. If you are willing to pay for his services, any handyman would gladly take on this job. We offer our clients a 3-YEAR GUARANTEE on our product quality subject to the completion of the Quality Checklist form included in our DIY application instructions (conditions apply). When making use of your own contractor or referenced private worker we can reference to help you apply your DIY product, you are responsible for the supervision and quality control. We do not cover the workmanship guarantee. The guarantee conditions as per the last page on our DIY application instructions are applicable to qualify for our 3-year product replacement guarantee. No less than THREE thick gloss top-coat layers ensuring a longer life span. We will supply you with the epoxy paint material to apply one primer coat and three gloss and chemical resistant top-coat layers for long-lasting durability. Every layer consists of a two-part epoxy resin and hardener combination. We can email you our full application instructions right away: Click Here. Why a 4-layer system with a specialised primer ? In general, the thicker the epoxy layer, the longer the lifespan of the coating. Whilst this a good feature offered by our three-layer top-coat system, the higher viscosity of a thick top-coat product offers less penetration capability into the substrate. A thick top-coat epoxy offers neither deep penetration into the substrate nor the same bonding strength that a specialised concrete primer can achieve. This is why we utilize a specialized industrial-rated concrete epoxy primer for penetration and bonding, followed by three durable topcoat layers. The better the penetration of the epoxy into the substrate, the smaller the chance of delamination. Therefore, penetration and bonding strength are the main reasons we incorporated a primer layer. This can only be achieved by utilising a lower viscosity epoxy concrete/cement primer. Following this, the primer is also chemically matched to the top-coat layers to create a "chemically fused" bond with the thicker top-coat epoxy layers in order to prevent inter-layer delamination. Our epoxy system, consisting of a specialised industrial-rated primer epoxy for concrete and plastered surfaces combined with the three top-coat layers, was tested to offer up to 500Psi (Pounds per square inch) or 2.8Mpa (Newton per square millimetre) bond strength to marblite, concrete, cement, and fibreglass surfaces, causing substrate breaking under test. So, there you have our well-tested secret from experience, and it makes sense, doesn't it? Unfortuanately many one- or two-layer "quick-and-easy" solutions on offer are resulting in the pool paint market not having a good report in general as can be seen on hellopeter.com and numerous customers comming to us after losing there money on these short-lived solutions. Our installation dealers are reporting back on fixing these swimming pools on a regular basis for clients. 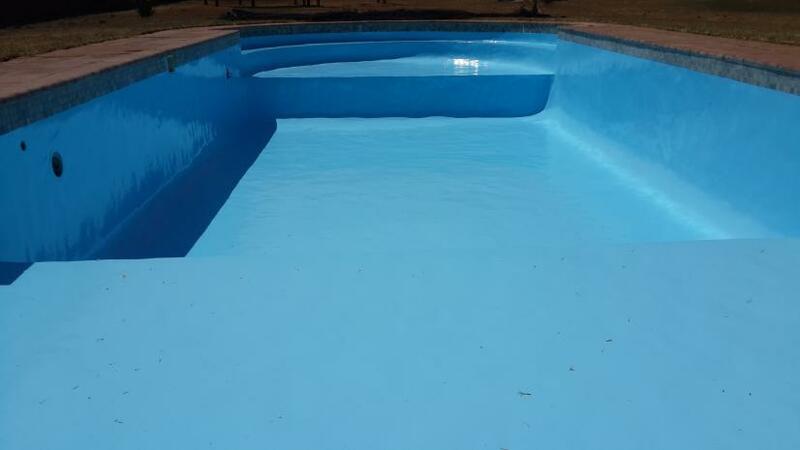 Using our latest developments and upgrading from the traditional, older type epoxies to the latest technology epoxy resin and curing agents, we have overcome many problems associated with older type swimming pool paints. We tested an industrial-rated concrete primer epoxy to provide us with the highest possible bonding strength. It will never come loose from your swimming pool when applied on a solid dry surface, our solvent-free primer is not thinned down with solvents or water. It has been specially selected for its tested use on challenging industrial concrete surfaces. We further developed and perfected a gloss epoxy top-coat that is 100% algae resistant and highly chemical resistant. Normal HTH Dry Chlorine, HTH drifter packs and pool acid can be added directly into the swimming pool without any risk of staining. Algae infestation is completely blocked and you will enjoy a permanently clean, shiny surface that can easily be maintained with minimum chemicals. Unlike many pool paint products that are prone to structural breakdown in submerged conditions due to the absorption of chemicals, water, and sunlight, the chemical reaction between our high-solids formulation epoxy resins and hardener components, forms circular, molecular "honeycomb" structures that are virtually impenetrable by other substances. Does this mean our product is indestructible? No. Please see our FAQ page for a list of pool chemicals we have found that can stain the product, as well as the chemicals which we have tested that we can safely recommend. High metal content clarifiers and water treatment products may cause discolouring. As a pool owner for many years, I know the frustrations of keeping the pool crystal-clear, blue, and stain-free, especially if one has a marble plaster pool. 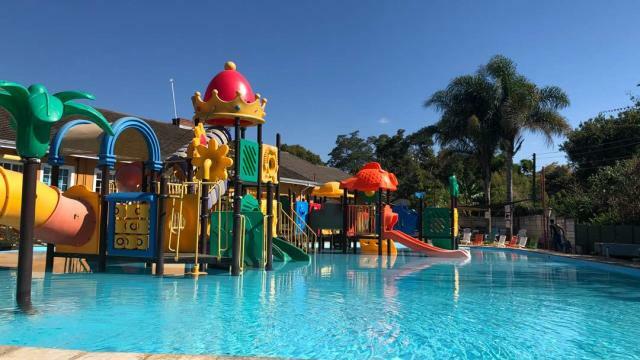 The constant attention these types of swimming pools need on a weekly basis and the amount of chemicals one needs to administer it have the knack to take the joy out of owning a swimming pool. After trying different products on the market to resurface my swimming pool with disastrous results, I came very close to finally giving up on swimming pools. why would it not work on my swimming pool?" After testing the product and seeing the results, I bought into the concept. Today, I am the proud owner of a swimming pool that catches the eye of every visitor, is an absolute pleasure in summer times, requires low-maintenance, and enhances the tranquillity of my garden. The final result of this discovery is that you, too, can now benefit from our investment into the research and development of a DIY pool paint system that is specifically designed and tested for submerged marble plaster, industrial concrete, and fiberglass surfaces. Continue reading to learn what the difference is between older technology curing agents and our developments implementing the latest technology in epoxy curing agents and UV-stable pigments in our pool paint formulations. Is your marble plaster pool suffering from water loss? It could be that the pitting of the porous marble plaster structure has caused small holes where water is leaking through. 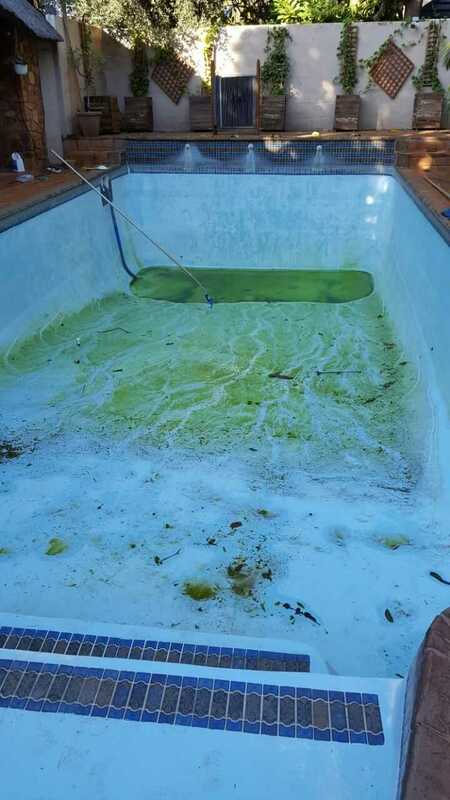 Pitting, caused by severe algae growth and overdose of chemicals, might have softened the softer spots of the pool, allowing algae to penetrate deeper and deeper. Pitting is a result of adding too much chemicals over a long period of time and the subsequent softening of the marble plaster. Another factor is aggressive water conditions due to LOW CALCIUM or "Total Hardness". 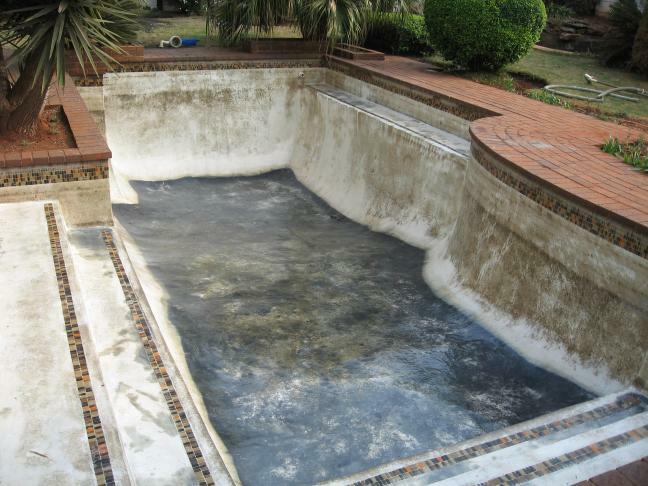 If left untreated for too long, your pool can be permanently damaged and caused to leak. Swimming pool repairs can become an expensive exercise. The pool below was repaired from severe pitting deterioration in 2000 and coated with our specialised epoxy pool paint. Before spending your hard-earned money on just any off-the-shelf pool paint or so-called swimming pool epoxy, at least do a little bit of homework. Lack of proper pentration and bond-strength typically related to epoxies/paints advertised as an easy-to-apply one- or two-layer solution. Some substrates are too dense to allow proper penetration by a top-coat-only solution. One-layer solutions (no primer) must found a compromise between coating thickness (higher-viscosity) and penetration ability (lower-viscosity). These generalised one- or two-layer solutions just can't offer the best of both worlds. Extensive chalking and cracking after a few months due to lack of chemical- and UV-resistance. 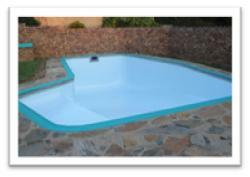 Some products originates from the floor epoxy industry and are sold as a swimming pool coating. These products will start to get powdery within 6 months and will eventually blister or crack, get plucked from the sides and deposited small chip pieces into the weir and pump filter, causing flow restrictions for years. Fast colour fading and/or staining by water, chemicals and UV-radiation. If the product datasheet indicates that the product might suffer pigment-wash and discolouring by water, even after days of hardening, be aware! A product specifically developed for submerged conditions and for outdoor use should offer rain-resistance within hours. If the datasheet indicates the product can be discoloured by rain even after days of drying, the product is clearly not suitable for submerged conditions. Early water-resistance should be one of the main design qualities of the product. Chermical resistance may then also suspect to be weak. 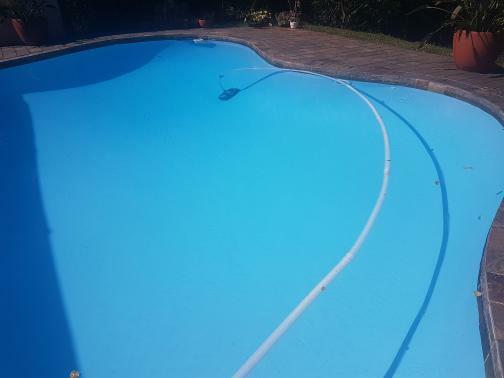 First, ensure that you are dealing with a pool paint supplier that has a track record, offers a guarantee with long-term references up front, and has been operating under the same name (manufacturing epoxy paints for swimming pools, of course) for many years. As we have experienced with disgruntled customers contacting us, many will offer you ridiculous guarantees, but in five years’ time they would have changed their name again and you have no grounds for a guarantee claim. Some pool paint suppliers claim that they have been in the market for 25 years plus, yet they cannot offer swimming pool client references older than 3 years. If their existing company name is less than five years old and they offer long warranties, the warranty period is cearly a marketing scam. Obtain references that are at least as old as their advertised warranty period. Hot tip: Go check out the creation date of local website domains here: http://co.za/whois.shtml for .co.za domains. Enter the name of the website e.g., "poolsolutions" (the .co.za part will automatically be added, do not enter "www" at the front of the name). Search down the list and find the field "creationdate". For international .com domains, you can follow this link: http://whois.net. If a website advertising pool paint is not as old as their warranty period, be careful! Many swimming pool paint formulations have been inherited from traditional indoor floor coating formulations. 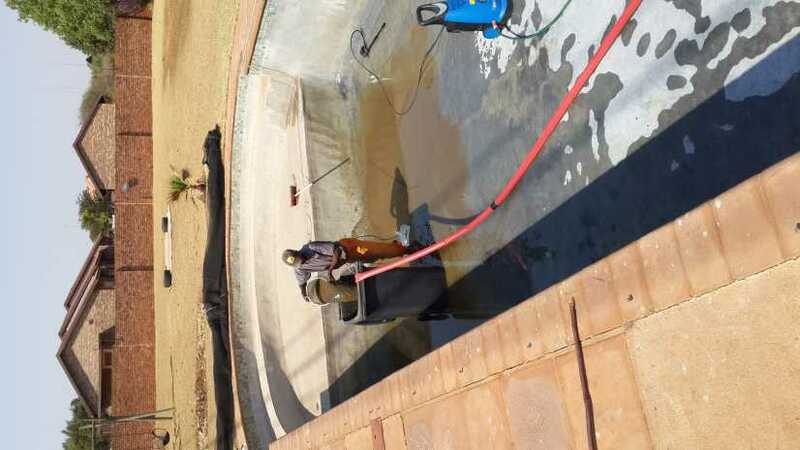 In most cases these epoxy formulations have never been upgraded with better curing agents and protectors to provide a longer lifespan in the harsh environment of the permanently submerged and chemically-rich conditions of a swimming pool. If a supplier is reluctant to supply technical data relating to his product, he is probably not in control of the testing and development of the product and may not have the technical skills to develop it further or keep up to date with the latest technology. 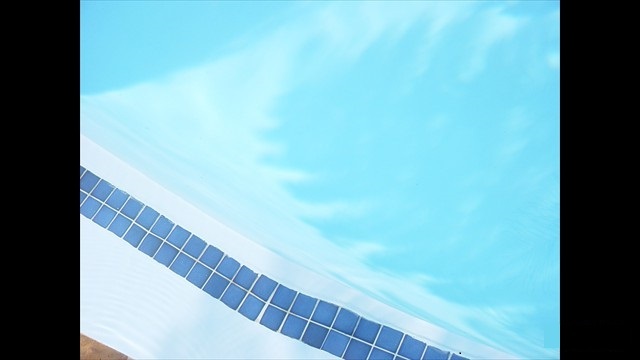 We developed and finalised our own product formulation specifically for swimming pools by 2003, phasing out the traditionally-used Polyamide curing agents and replacing it with the latest technology in chemical-resistant curing agents. This has greatly improved stain resistance, early waterspot resistance (no staining or pigment wash by rain after 4-6 hours of drying at 25 °C; 8-10 hours during colder winter conditions) and non-yellowing qualities as you can see on our Technical Products page. In 2007, we upgraded to the latest high-grade Rutile Titanium Dioxide base pigments that offer 3-5 times the protection against UV-light radiation as well as chemical-resistant and UV-resistant liquid colourants. In 2014 we again upgraded to the latest curing agents targeted for application in submerged conditions. In September 2018 we introduced new curing agent technolgy to offer even better UV-resistance and colour stability even under adverse conditions. We are constantly testing and improving our product with the latest technology as it becomes available. We don't claim to have an indestructible product. It has limitations and an expected lifespan of 8-10 years (with a few customers reporting up to 15 years), depending on how it was applied and how the customer maintains his swimming pool water. We will compare our product to fiberglass linings and marble plaster, and tell you honestly what are the advantages and shortcomings of each. We will give you the facts – the choice is up to you, the customer. Each product type has its marketplace at a certain price level. Read the next section for a comparison. You can read more about our tests and developments on the Technical Page. If you ask your local swimming pool shop owner about pool paints or epoxies, he/she might advise you to rather re-apply marble plaster. First of all, we don't blame them! Many have had a bad experience with a cheap, DIY, off-the-rack paint product from a local hardware shop. 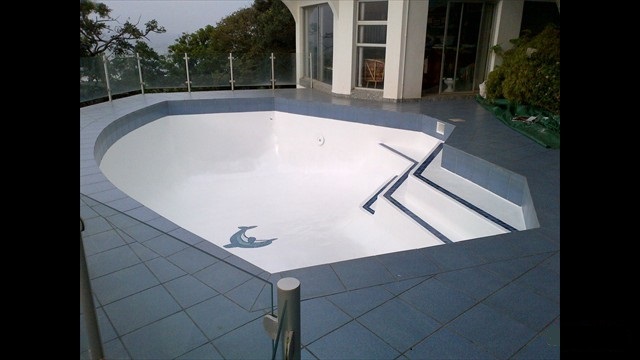 There is, however, a huge difference between a single element paint and a two-part, specialised epoxy pool paint system. Our epoxy formulations are specialised combinations, consisting of no less than 15 different ingredients, carefully selected and measured to provide specific qualities specifically formulated for submerged surfaces. The final product consists of resin and hardener main components that chemically react and bind to form a hard, enamel finish. Marble plaster also referred to as mabelite is a thick strenghened cement type finish that is stong and can offer years of functional service. The draw-back of marbelite is the commaon problems related the long-term appearance. The reason your pool got stained and lost its colour in the first place is due to the fact that marble plaster pools are, and always will be, prone to algae infestation. The more algae you see, the more you tend to add acid and other deterrents, softening and eating into the marble plaster to create even more microscopic space for the algae to settle and grow. It is an ever-increasing cycle that will keep on repeating itself. Applying marble plaster again will not solve the staining and colour loss problems in the longer term. It is a costly exercise for a temporary solution. Fiberglass, like an epoxy coat, is not prone to algae infestation. 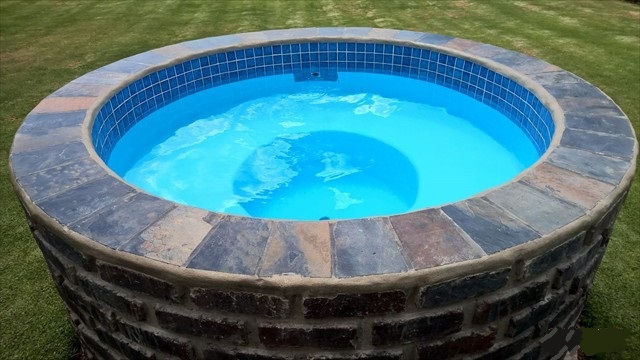 Although quite expensive, it can be a quality solution that can last for many years if installed by experienced and reputable fiberglass pool builders. It is recommended for good appearance, less water-maintenance problems and where possible structural movement might be a problem. There are sometimes problems related to fiberglass linings, i.e., the accumulation of moist behind the fiberglass lining, especially where fiberglass is installed on existing structures, causing lifting of the lining from the base structure, in turn causing bubbles, cracking, and eventually leaks. This is a problem we have encountered many times. Considering the price tag on fiberglass linings, it can also be a costly exercise should it result in the total loss of the lining within a few years. When fiberglass is applied later on as an upgrade, the possibility of the top edge underneath the coping stone pulling away and allowing water to enter behind the lining also becomes a reality, posing the same problems mentioned above. Epoxy paint coatings have the advantage that they cost far less to apply, are easy to repair, and can even be applied as a very cost-effective DIY solution. Epoxy coatings can easily be refurbished by re-applying two new top layers at 50% or less compared to the original full installation cost; even less (approx. 25% of original installation cost) if you re-apply it yourself as a DIY job. General maintenance on an epoxy-coated pool is a breeze, with reduced algae growth requiring less chemicals to maintain water clarity. For best results and a longer lifespan, the swimming pool water should generally be kept within balance and should be tested at least once a month. Limitations: the ageing process on the epoxy coating is a gradual thinning of the coating. After a normal life expectancy of 8-10 years of service, you will notice the substrate or primer layer starting to show through in certain spots; then it is time to re-apply two new and thick top-coats. Re-application if you do it yourself can be done for approximately 25% of the original installation cost. Although our product is well-tested and performs very well when the recommended chemicals are used to maintain the water, it is subject to damage by certain aggressive products that might reduce the lifespan or appearance. See our FAQ page for more information. As with all types of pool surfaces, attention should be given to test the Calcium Hardness (Total Hardness) after filling the pool. Total Hardness (Calcium content) readings below 350ppm might increase chalking of the paint and will reduce the lifespan. CAlcium Chloride flakes can be obtained from us and other outets and should be checked every 6 - 12 months. A swimming pool enemy not many pool owners are aware of is low alkalinity and especially low Total Hardness (low Calcium Hardness). 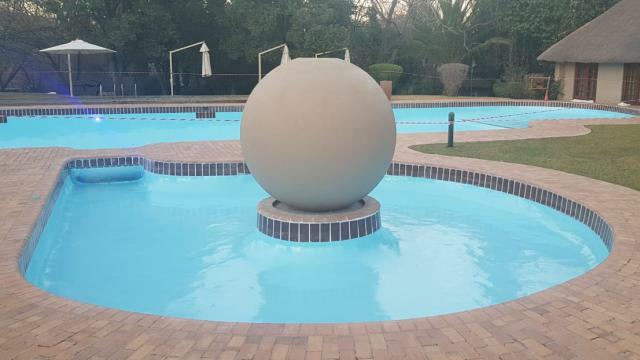 Staining and pitting on marble plastered pools, severe chalking of epoxy coatings, or discolouring and deterioration of fibreglass linings are often caused by low calcium levels. If this condition is not corrected and tested once in every 6 months, it will cause damage and even your epoxy-coated pool will be severely affected, reducing the lifespan of the product. Testing the water every 6 months for "Total Hardness" will prevent the calcium levels to fall too low and the water to become aggressive towards the epoxy paint layer. Total hardness is also indicated on some water test strips (see picture below) and must be kept well between 350-550ppm regardless of swimming pool shops' recommendations. Ideal levels indicated on print-outs by water test machines are too low and not on par with the latest research findings. This is not a fluctuating condition and only needs to be checked after filling the swimming pool with fresh water. 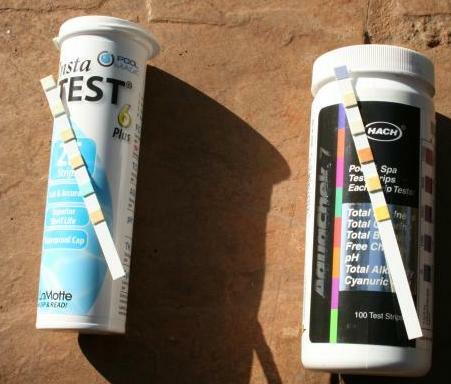 The type of test strips shown below can test for "Total Hardness" and are available from Pool Solutions. 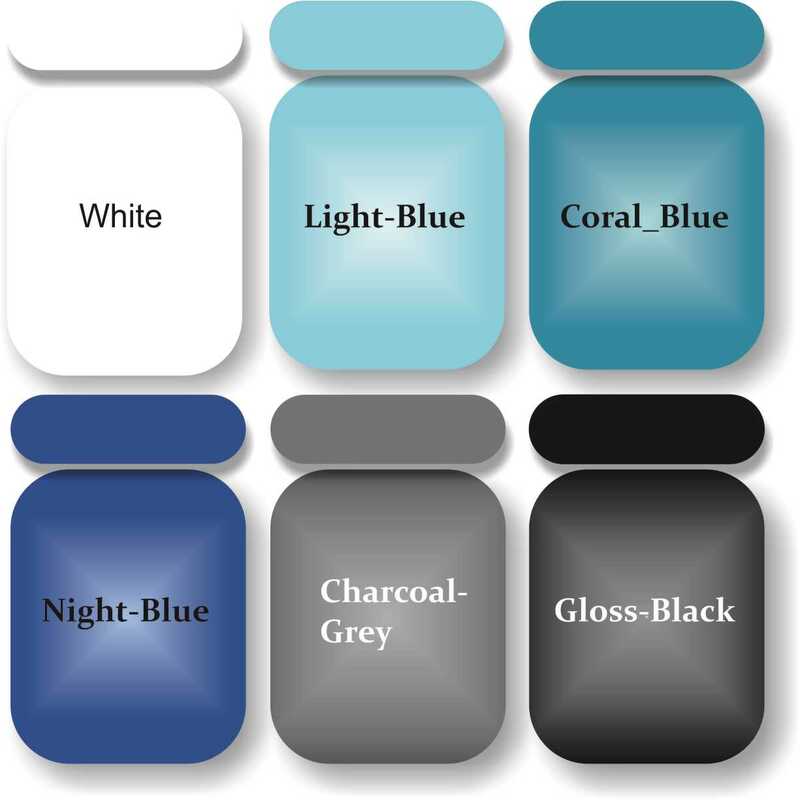 The Insta Test 6 Plus test strips can be ordered to be included with your DIY epoxy paint package from Pool Solutions. A well-developed epoxy paint system consists of two main elements, namely an EPOXY RESIN and a CATALYST (HARDENER), as well as many other additives. Our own product consists of no less than 14 different elements. The combination of the two main binding elements does not rely on the evaporation of solvents or water to air-dry like most single element paint products. Paints do not chemically form the molecular ring-bound structures that resist foreign element penetration into the coating. A true epoxy system will normally have an A- to B-part ratio of between 2:1 and 4:1. Our product has been tested on concrete and marbelite and offer bond-strengths of up to 400 psi (2.8 MPA), resulting in concrete substrate breakage under test. It is a scientifically proven fact that large percentages of solvents or water in the formulation will adversely affect qualities like bonding capability, colour stability and penetration resistance to water and chemicals. These products are commonly found in normal paints or watered-down epoxy products. In a specialised epoxy system, chemical binding of the Catalyst molecules exactly weighted to match the molecular mass of the Resin part causes a chemical reaction which forms microscopic circular structures almost like a honeycomb structure. This circular formation is a thousand times stronger and thus less prone to penetration by water and chemicals, and, in our case, 100% immune to algae infestation. We offer a high-solids (90%) formulation with zero or very low solvent content (0-10%) in the top-coat. Except for the enjoyment you and your family will get from of an aesthetically pleasing swimming pool, a well-looked-after swimming pool has also proved to be an important asset to any private property owner. Any estate agent will confirm that a swimming pool that is in bad shape is not an asset to your property value but, instead, a definite turn-off. Fact is, it will turn away many prospective buyers who just aren't ready for the hassles of owning a swimming pool that is in bad shape, or they might use it as a bargaining chip against you. 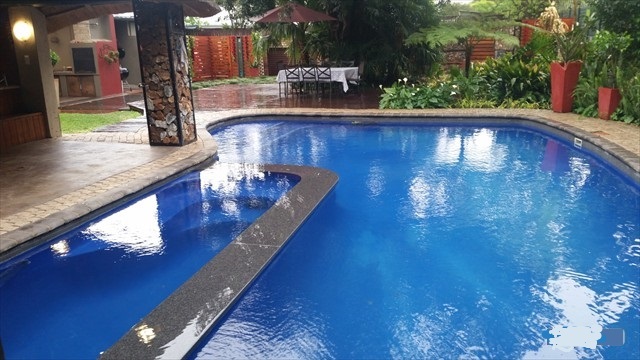 A sparkling clean pool with crystal-clear water will tend to have that positive emotional influence on any potential buyer, especially if you tell them how it is possible to own a swimming pool without the normal frustrations. Use this to your advantage as a seller. 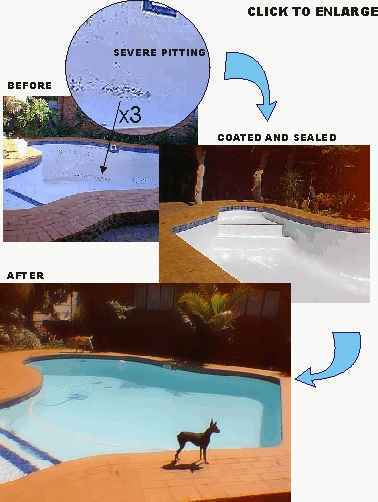 You need a quality pool paint epoxy to stop the ongoing deterioration of your pool. Don’t allow your investment to reduce in value. 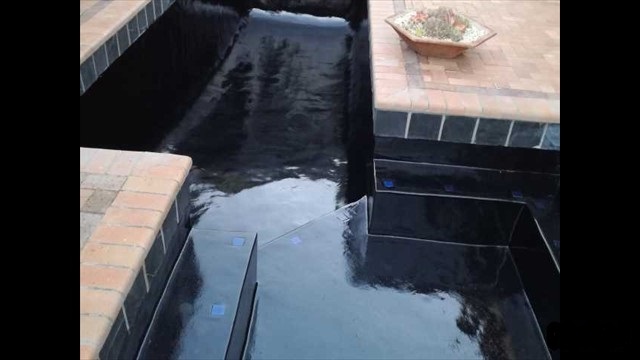 The money you spent to enhance the appearance of your swimming pool will be an investment that will return 300% or even a 500% of the amount invested in a quality epoxy coat. 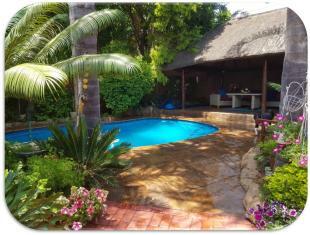 Change your swimming pool into an asset, adding value to your property. 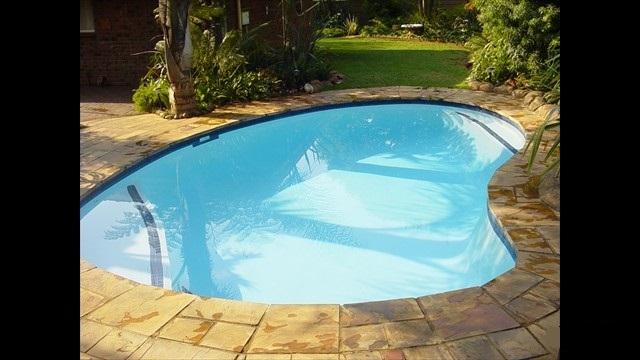 The condition of your swimming pool has a direct influence on your property value. 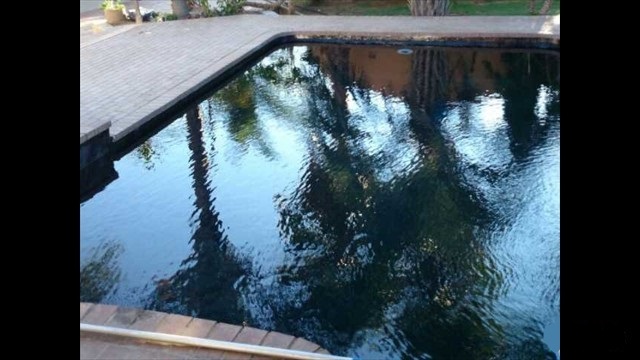 For instance, if your pool is stained and looks like it is in need of constant attention, it might have an adverse effect on the price offered for the property. This is because a swimming pool is a high point-of-interest to any potential buyer. On a property valued at R1.5m, your well-kept garden and good-looking pool contributes approximately R50 000 to the value. 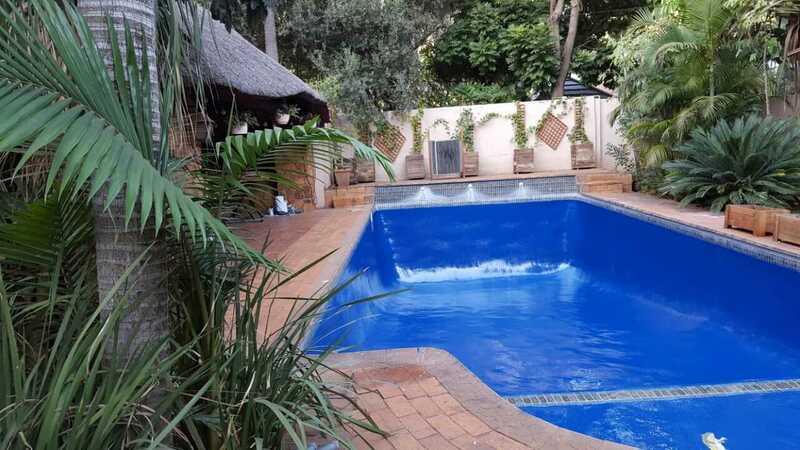 But let's be very conservative: If your pool draws negative attention you can expect to loose R50 000 on the offer! 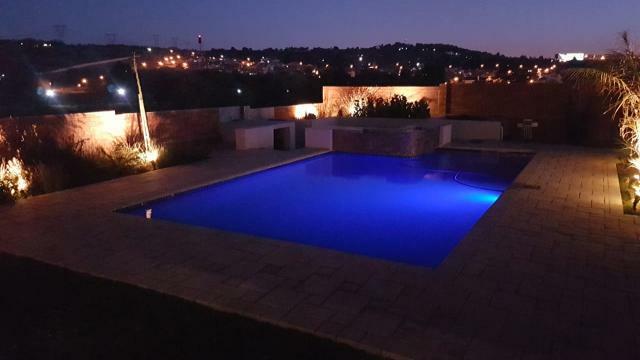 If your pool will cost you R 8 000 to epoxy-coat (depending on the size, this is a general average), and you can get the full R1.5m for your property because you have a beautiful garden and the pool that looks inviting, the amount spent to refurbish your pool yielded a huge return on investment. How new marble plaster will not solve the problem; it is money wasted! You can spend hours walking from pool shop to pool shop trying to find the magic chemicals that will transform your pool into a crystal-clear sparkling pool. But doesn't it make a lot more sense to skip the learning curve and get to the root of the problem? Click here to order a DIY package or to request an Email quotation. I trust we will hear from you soon and I hope you have enjoyed our web site. Remember to visit our other pages for even more information. packaged per order only, contact us to arrange for collection in The Willows, Pretoria. Dynamic Solutions 111 Trust (t/a Pool Solutions), the owners, affiliates, agents or employees will not be liable for any claim whatsoever relating to injuries, health conditions or loss of life under any circumstances during the use of any product supplied, during application, thereafter and during the use of the swimming pool. Who have successfully installed our product On a Number of Swimming Pools with good report. We refer them in good faith as an additional service offering to the public. therefore solely the responsibility of the contractor who is legally bound by written undertaking with us and the client. will be de-listed from our reference list. Contact - Business Area Cell / Tel Email : "(AT)" = "@"
Want to become an applicator/dealer - Click Here? 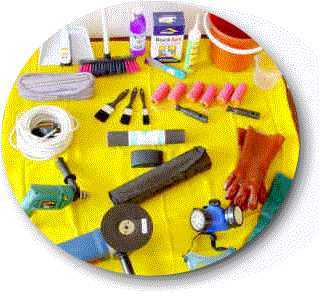 When making use of your own private worker or contractor to apply a DIY kit, the client is responsible for the supervision and quality control. We do not cover the workmanship guarantee. The guarantee conditions as per last page on our DIY application instructions are applicable to qualify for our 3-year product replacement guarantee. We will not disclose E-mail addresses or tel no's to anyone else. We will not phone you if not requested to do so. We hate spam mail, we don't send it. That's it! Copyright © 2006 Dynamic Solutions 111 Trust. Hot-tyre resistant, light-grey coating for indoor use on garage floors or light-industrial areas. Water-based epoxy. UV resistant clear-coat for outdoor paved areas or indoor floors. "...IT LASTED A FULL 11-YEARS"
I painted our pool with your product 11-years ago and it lasted a full 11-years. We got quotes for fibreglass and re-marblite and was shocked to hear it would cost more than what we paid for our first home. We took a family decision to do it ourselves and use the money we save to go oversees. We did exactly that! Now when we drink that glass of red alongside an absolute pristine pool, the satisfaction and smug smiles just don't want to disappear. "Lyk nog mooi na 15 jaar!" "Ek is so beindruk met julle diens." Baie vriendelik, professioneel, betroubaar en vinnig. Ek het meer as een kwotasie vir ons swembad gekry, julle s'n was die goedkoopste en die eindresultaat lyk uitstekend. 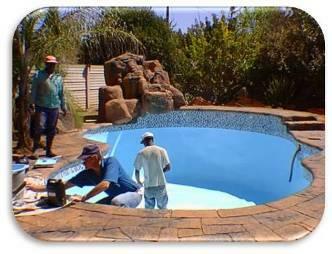 "astounded at the excellent service I got from them"
Some ten years ago Pool Solutions repainted my swimming pool. Now ten years later I once again contracted them to repaint the swimming pool again. As before, they did an excellent job. They arrived on the day they promised they would, did even more than what they quoted for and left me ,again, astounded at the excellent service I got from them. Celene is to be complimented on how her company is managed and run on a day by day basis. I can recommend Pool Solutions any time any day. "the product provided by them does not know its match in the market"
I wanted to refurbish my black marble lite pool. 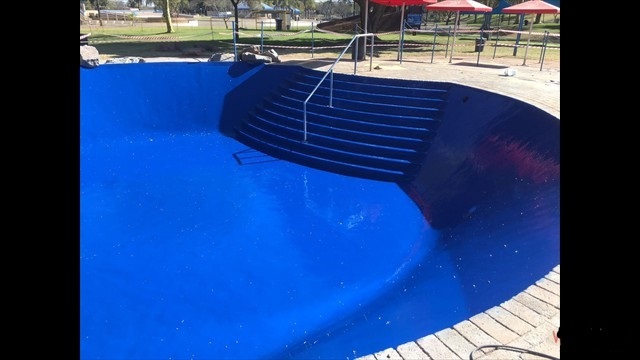 The requirement was to turn it into a normal blue pool. The obvious solution was to use Pool Solutions and the epoxy paint they are known for. From my previous experience the product provided by them does not know its match in the market. The request to do the job was executed with a high level of efficiency and customer care. It started with a fixed appointment that they kept. They actually arrived on time. This type of service is unknown to the general South African citizen. Attention to detail was excellent and the finished product superior. 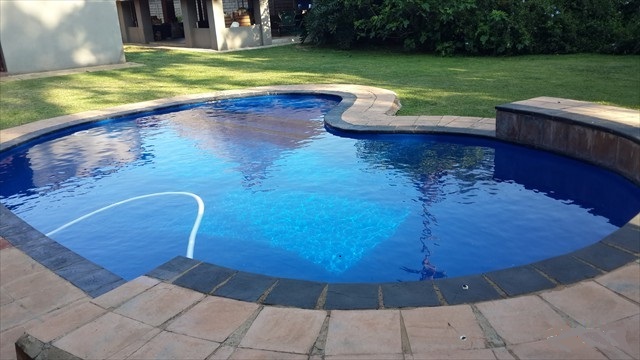 The value added part was the education provided on how to look after your pool on a day to day basis and thus protect your investment. This they based on many years of experience and one immediately could grasp that they are knowledgeable on the subject and what they are talking about. 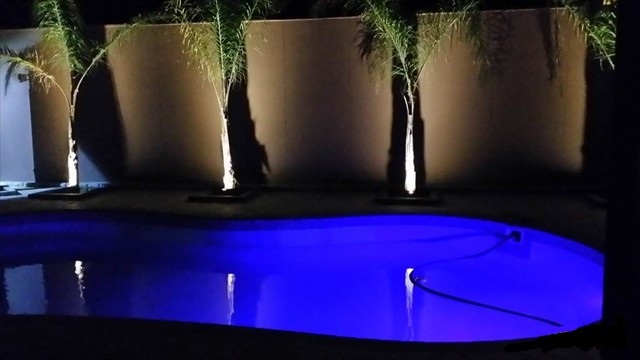 I can definitely vouched for the product and the service provided by Pool Solutions. "10 years of Stunning Looks"
We applied Pool Solutions' Epoxy pool paint in a DIY kit form in 2001 believing that it would last about 3 years. The result was a stunning light blue pool that always looked clean. Due to the fact that the epoxy paint dries to a ceramic like finish, algae does not take hold and I believe you use less chemicals to maintain the pool's cleanliness. The 2001 application began to wear thin and tarnish in 2012 and we are about to re paint using the same product. "You have a fantastic product and customer service". I take this opportunity to thank A&L Maintenance for their professionalism and high standard of workmanship displayed when attending to our pool repairs. We have in the past had various contractors who did absolutely shoddy work or simply failed to show. Attie and his team were always on time, prepared and extremely helpful. Their work area was consistently clean and their staff friendly and well informed. After the previous disappointments we were relieved to find a team who still pride themselves on excellent customer service and an end product that exceeded our expectations. Please extend our sincere thanks to your contractor and thank you for the recommendation. Herewith an updated photo of my pool since I repainted it. Its fantastic ,and so is your product. I just want to thank you for giving me the phone number of the worker (Brian) that helped me with my DIY pool paint project. He is a true asset for your Company, he is punctual, well spoken, respectful and to top it all really knows his job. His work ethic is amazing, he scrapped and sanded down the whole pool and before going to bed he cleaned the whole area. He was up again at 06h00 and ready to work. It is not often I throw bouquets but he is really an exceptional guy. The guys really assisted me well. I could call while I was coating my pool to get assistance. Due to the remoteness of the area from the supplier I needed to do the work myself. It took me 5 days, but the job got done. Ek het 22 Januarie 2015 my swembad se verf bestel en in Februarie die bad laat verf deur Brian. Brian het eerstens my totaal oorbluf met sy profesionele optrede en sy algemene handel en wandel. Alhoewel die bad nou minder as ‘n maand terug gedoen is, sal daar iets drasties fout moet gaan om my opinie oor die produk te verander. Dit het my hoogste verwagtinge oortref. “Well done” aan jou en jou span. Ek werk al 19 jaar in die hardeware bedryf en jy kan my enige tyd as verwysing opsit. 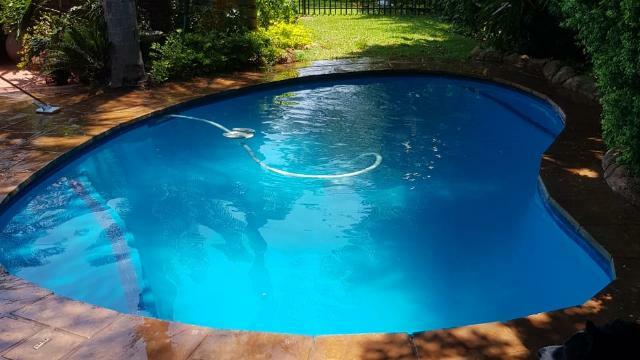 Ek sal jou produk aan enige persoon aanbeveel wat my vra wat is die beste “Pool Paint” en ek verkoop ander tipe verf vir ‘n lewe. Ons het hierdie swembad gedoen met julle produk. Duidelik kan gesien word hoe goed dit nou lyk. Ek wil hierdie wonderlike produk begin bemark. Net so bietjie terugvoer op die herstel en opknapping van my swembad. Ek het laas jaar die huis gekoop met wat ek gedink het is 'n ou veselglas swembad. Dit het toe uitgedraai as 'n selfgeboude bad met swak afwerking!! Na julle produk is ek nou heel in my skik en trots met die bad! Conclusion: The product is very good for DIY application, when you have some technical skills. 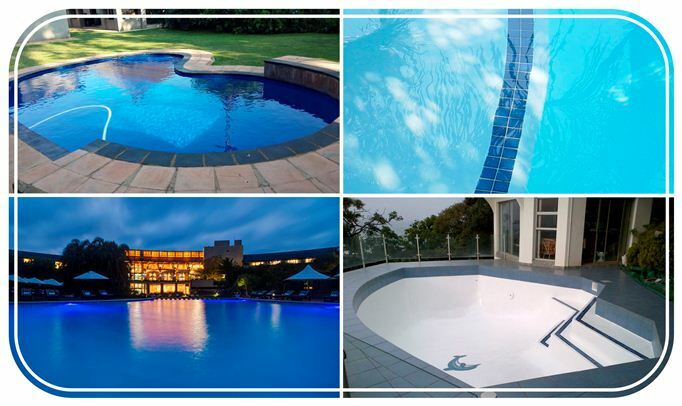 To mix always 2 l for direct use is easy to handle, to follow tediously the instructions is necessary, to be flexible with weather & helpers, and make sure that the pool is 100% dry, dry, dry. The preparation is the utmost important exercise in order to get a perfect result. So far we enjoy the "new" pool now everyday. 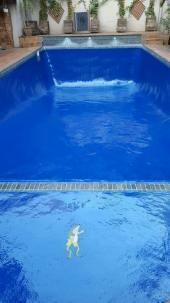 Please see attached photo of my pool after the paint-job. Many thanks to Celene Smit for your prompt delivery of my orders and I look forward to referring many customers to you. "Thank You For a Product That Lives up to Your Promises"
About 2 years ago I painted my pool with your product and whilst it was not an easy job ,which I did almost single handed , I am absolutely delighted with the result and am continually complimented on the sparkling pool which , as you claim, uses dramatically less chemicals than before. "What a beautifull outcome to my pool"
Thank you very much for the wonderfull product that i bought from you guys earlier this year. 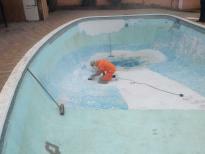 I started with the grinding of the pool last friday and with the primer yesterday and finish with the topcoats today. What a beautifull outcome to my pool. I hereby include before and after photos of my pool. "The quality of craftsmanship was excellent"
I had my pool for +- 14 years and the stains were just too much. I tried various chemicals to clean the pool with no success. Algae were a major problem and no matter how hard I tried to curb the rapid growth thereof, I wasn't very successful. I was quit desperate and almost re-marbled the pool at a very costly price. Then I saw an advertisement of Pool Solutions. Pool Solutions renovated my pool in 2005. I must say they did a brilliant job! My pool looks like new one and unlike the past, it now is a focus point of the garden. I have no hesitation in recommending their service. Not only was the work done quickly, but the quality of craftsmanship was excellent. I had to refer their service to my friends who subsequent also made use of their services with much satisfaction. If you feel that you have reached the end of the road with your swimming pool, don’t give up…..give Pool Solutions a call. Like I say: “Cry now, and swim tomorrow”. 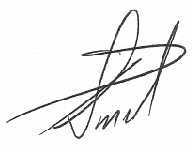 "my absolute tevredenheid met die puik diens"
Ek wil graag my absolute tevredenheid met die puik diens wat julle/Pool Solutions tot op hede gelewer het meedeel. Ek het vanaf dag een eerlike, professionele raad en inligting ontvang. Julle produk kennis het 'n gevoel van gemoedsrus afgedwing en ek kon nie anders as voel dat ek die regte besluit geneem het om met julle /pool solutions produk en diens voort te gaan nie. Baie dankie vir die vriendelike wyse waarop jy graag kennis deel, selfs al is dit net 'n kort telefoon gesprek. Eben, Nelie en De Wet. "Ons het lanklaas met 'n firma te doen gekry, wat begin werk, en dit klaar maak"
Ons swembad lyk pragtig. Ons het lanklaas met 'n firma te doen gekry, wat begin werk, en dit klaar maak. Skip en sy werkers was fantasties! 'n Mens kan sien hulle ken hulle werk! "Wonderful experience in dealing with your company"
About a month ago I made contact with your company to do an inquiry about your pool paint. On phoning yourself and your wife ,I was very impressed with the service I get from your company ,with that I bought your product . I can say wow what a product and it really works well and even if you are a DIY man it is so easy to use . I have attached some pics of pool that if you like ,you can use on your website or portfolio . Once again many thanks for all the assistance and wonderful experience in dealing with your company. Just a word of thanks for an amazing job done on my swimming pool. 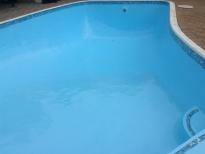 I struggled for months trying to get my pool blue without any success and a substantial cost. My pool has never, even when it was new looked as good as it does now, it’s a pleasure to sit by the pool. I think this was the best investment I ever made and would recommend anyone to do the coating to their pool. Celéne and Philip, I would like to thank you for this product, my pool is looking better than the day I moved into my house. I am impressed with your product and most of all the service you gave me. In a cut throat business like this you don’t get the quality of service you provided. I wish your business every success imaginable. One very extremely happy client, big ups to you guy’s.